Gold is extremely valuable and probably the most sought after of all the valuable metals found on earth. All things of the physical universe which can be sensed by man are made up of one or more chemical elements. An “element” is a basic simple substance which cannot be further broken down by chemical means. Elements are the basic building blocks of the material universe in which we live. Scientists have discovered over 100 basic elements, and have laid them out in order according to their atomic structures on the “periodic table of elements”. For eons, man has dwelled upon where gold might originally have come from-that is, its native source. Scientists have recently discovered that gold can be artificially produced by the atomic bombardment of lead, which is another basic element. However, the process is very expensive, more so than the monetary value of the resulting gold. So gold is not artificially produced on a commercial scale. However, this discovery has brought on the theory that the gold being found on our earth might originally have been manufactured in the nuclear furnaces of stars which have long since vanished, our planet being part of the remaining debris. The scientific symbol for gold is Au. It is number 79 on the periodic table of elements. Gold is not magnetic, but it is an excellent conductor of electricity. Its melting point is 1945° F. Gold is not corroded or tarnished by moisture, or oxidized (rust) by the effects of oxygen and water, or affected by ordinary acids, as most other metals are. Deposits of gold that have lain inside a mountain or under a streambed or even on the ocean’s bottom will remain there and be rather unaffected until moved by the natural forces of the earth-or taken by man. Gold is a very soft metal, being 2. 3 on a hardness scale of 10, which is one of the factors giving gold its tremendous malleability-meaning that it can be pounded, twisted, rolled and/or squeezed into all kinds of different shapes without breaking apart. In fact, the yellow metal can be pounded so thin that it is translucent, and yet still remain intact as a solid sheet of gold. It has been said that such sheets of gold can be produced so thin that it would take a quarter of a million of them stacked one on top of the other to make a pile just one inch tall! Thin sheets of gold such as these have the distinctive quality of allowing sunlight to pass through, yet they will reflect off a large portion of the sun’s infrared rays (heat). For this reason, thin layers of gold are now being used in the window glass found in many of today’s modern skyscrapers to help save on the tremendous costs of energy necessary to keep the interior of such buildings cool during the hot summer months. Similar films of gold have also been used in the face shields of helmets used by astronauts to reflect off much of the increased bombardment of infrared rays which occurs out in space. Gold is extremely ductile-meaning that it can be drawn out into wire or threadlike forms without becoming brittle and breaking. It is said that gold can be drawn out so thin that a single ounce could be made to stretch a continuous length of 35 miles. That would make the thread very thin indeed, but that is exactly what is needed in today’s electronics industry, where entire circuits are being placed in chips the size of a pinhead. Because of its high electrical conductivity, its extraordinary resistance to deterioration and its ductile qualities, gold is in great demand by the electronics industry. 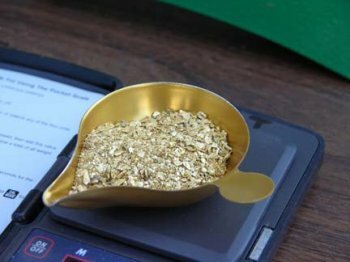 So it is not uncommon to find gold being used in the circuits of many of today’s common everyday electronic devices-like TV’s and calculators, not to mention in some of the more sophisticated electronics of today’s world. Gold is also commonly used by dentists and is widely used to make jewelry. Gold’s use in the making of coins has greatly increased within the past few years. Gold is not the most valuable metal, but it is extremely valuable and probably the most sought after of all the valuable metals found on earth. At today’s market exchange value, that same cubic foot of pure gold would be worth in the neighborhood of 10 million dollars. A cubic inch of pure gold would be worth about 7 thousand dollars. So gold is valuable, very valuable indeed; and it does not take very much of it to accumulate a considerable amount of wealth. There is one other distinctive quality of gold worthy of mention. In its natural form, gold is a very rich and beautiful substance to look at. In fact, this is so true that there is a saying among experienced miners, and those individuals who handle a great deal of the yellow metal, that it is not a good idea to look at any substantial amount of raw gold for very long at any given period of time. This is because it has a tendency to bring on a condition referred to as “gold fever.” This is true! “Gold Fever” affects different people in different ways. While it might make one person want to buy the gold at almost any price, it could just as easily make another want to steal it-at any price. However, the “fever” tends to always make a person want to have the gold for him or herself, and more of it if possible, with the means of getting it depending upon the character of the individual. This condition, (gold fever) is something to take note of for anyone who is planning to get involved with mining or dealing with gold. This is nothing to laugh off, for it has been the cause of a great many deaths, failures, wars, enslavements, and loss of friendships. It has altered the course of a significant amount of history- much of it being worse for the others involved. It is true that for many, gold is the thing that dreams are made of. Therefore, gold has a tendency to strike below the social behavior in a person and bring out some of the stronger passions which lie underneath. It is well to keep this strongly in mind during the stage in which you are considering whom to take on as a partner (or as employees) in a gold mining venture of any size. One common characteristic of a person who has been touched just mildly with a case of gold fever is that he or she tends to throw good business sense to the wind and dive in head over heels, much as a young child might do if he found a tub full of his favorite candy or ice cream. It is this very same factor that the con-man stirs up and plays off of. And if you think that there aren’t a few experienced ones in the gold mining field-think again. The majority of failures in gold mining ventures are the result of this same loss of good judgment which sometimes occurs when dealing with the valuable metal. Perhaps the most successful precaution against being struck to any harmful degree with the “fever” is in honestly taking on the viewpoint that “anything worthwhile is worth lots of time and effort.” It is the persons who intend to get rich quickly without much energy output on their part who most often fail in the business of gold mining. If, upon examining your own intentions, you discover that you are interested in getting rich quickly, without having to work for it, it is almost a certainty that you have caught at least a touch of the fever. On the other hand, if you are interested in going out into God’s country to see if you can find some of the yellow metal as an adventure, and/or perhaps to see if it can be done as a viable business enterprise, you are probably on the right track and you are more likely to succeed. And who knows, maybe you will strike a big one; it happens! Just remember that the finding and recovering of gold is similar to any other business venture. It takes a fair amount of time and work to get consistently good at it. Take it on as such and you will have less trouble-and fewer losses. Scientists believe that the earth is an extremely solid mass, which grows more and more dense towards its center. It is believed that the gold which is found on the earth’s surface and in its outer crust was once deep down inside the earth’s molten mass and was carried up to the surface by the effects of volcanic activity. In hardrock form, gold is generally found associated with quartz in the form of veins which protrude through the general mountainous rock–referred to as “country rock” by geologists. In the early days of gold mining, it was generally believed that these quartz/gold veins were once pushed up out of the lower bowels of the earth as volcanic magma. Upon this principal, it was thought that a vein should become richer as it was followed deeper into the earth. However, this was not always the case. More recently, it has been discovered that most quartz veins were not formed during the same time period as the country rock that surrounds them, but later. The cooling of the earth’s outer crust (country rock) apparently caused many cracks and fissures from which the gasses and superheated steam could escape out of the earth’s molten interior. These water vapors also carried minerals with them through these avenues of escape, with one of the predominant minerals being silica–which forms quartz. The water vapors carried other minerals upward too, of which gold, silver, iron and platinum are just a few. Silica has distinctive characteristics of its own, one of which is that it tends to trap heavier elements when they are passed over and through it in a dissolved form. So while the water vapors pushed the heavier minerals upward towards the earth’s surface through cracks and fissures, they often combined with silica and formed vein-like structures. “Ore” has been defined as any deposit of rock from which a valuable metal or mineral can be profitably extracted. When a valuable lode is found, in order to mine it, the ore is usually blasted out of the vein and is crushed down into a very fine powder from which the gold, silver and/or other valuable minerals can be extracted by any number of chemical or mechanical procedures. This entire process is called “lode mining” or “hardrock mining”. Millions of years passed after the rich mineral lodes were formed, during which time a large amount of weathering was caused by heat and cold, animals and vegetation, rain and wind, snow and ice, glaciers and their resulting runoffs, earthquakes, and ocean tidal changes as great as 800 feet in elevation for each tide. That was due to the moon revolving closer to the earth during an earlier period. 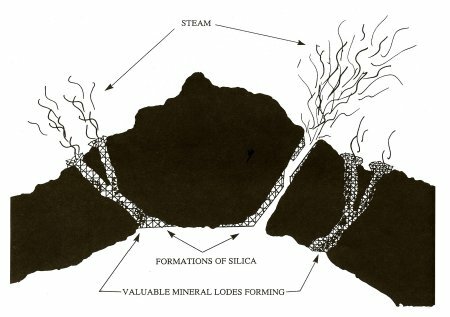 So, after the rich veins were formed, a tremendous amount of disturbance and erosion took place which washed many of the exposed rich mineral lodes out of the mountainous rock and into the stream and river systems which flowed during that time period. “placer deposits” (pronounced like “plaster”–without the t). Finding and recovering placer gold deposits requires an understanding of where heavy sediments will collect while being transported by the forces of water during large flood events. get pounded smooth as it is being washed further from its original lode. An experienced prospector can sometimes get a pretty good idea of how far a piece of gold has traveled from its lode by the degree of roughness on its outer surface. In its native state out of a lode, gold is almost never 100-percent pure, but has a percentage of other metals along with it. These other metals contained with gold, whether of value or not, are called “impurities.” The impurities with gold most often consist of silver, copper and a little bit of iron, platinum and cadmium in differing amounts. The proportions of these other minerals change from lode to lode, which gives the gold coming from one location different colors, qualities and value from the gold extracted from another location. When someone finds gold, either in placer or lode form, it is not uncommon to have the gold tested (“assayed”) to find out what percentage of impurities are present and exactly what they are. The actual gold content in native gold just out of a lode or placer deposit changes from location to location. But a reasonably safe average (at least in California) would be to say that 80% is gold and 15% is silver and/or copper. Pieces of placer gold, and those pieces which have eroded from a lode, are found in a wide variety of sizes and shapes, ranging from large pieces (“nuggets”) as great as 200 pounds in weight (very rare) to “flakes,” and smaller “grains,” and even smaller “dust,” down to pieces so microscopic in size that it would take perhaps 8 million particles combined in order to accumulate enough gold to value one dollar. 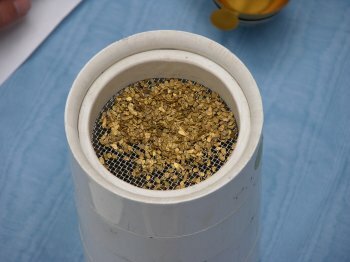 The system commonly used to classify the size-differences of gold is normally accomplished with the use of mesh screen. “Mesh” signifies the number of openings contained along a lineal inch of screen or wire cloth. For example, a screen labeled “10-mesh” would contain 10 openings per lineal inch, or 100 openings per square inch. “Twenty-mesh” would have 20 openings per lineal inch, or 400 openings per square inch, and so on. Those pieces of gold which will pass through 10-mesh (1/16″ sized openings), yet will not pass through 20-mesh (1/32″ sized openings), are classified as “10-20 mesh.” Gold passing through 20-mesh which will not pass through 40-mesh (1/64″ sized openings) is classified as “20-40 mesh,” and so on. Gold is often classified and labeled according to its size. Various sized pieces of gold are labeled as to their different mesh sizes. 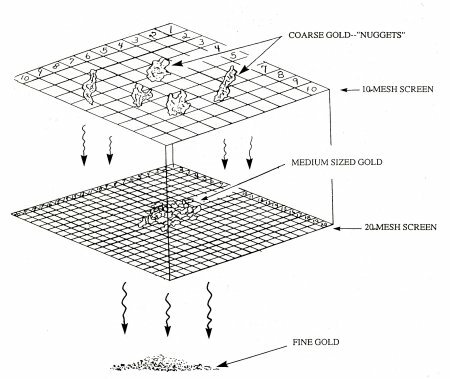 “Coarse gold” or “nuggets” are agreed to be any pieces of gold which will not pass through a 10-mesh screen. Medium-sized pieces of gold, flakes and so forth, are of the 10-20 mesh range, of which it would take an average of 2,200 separate pieces (“colors”) to make up a troy ounce. “Fine gold” is of the 20-40 mesh size, of which it would take an average of 12,000 separate colors to make a troy ounce. “Flour gold” or “dust” includes all pieces which are smaller than 40-mesh, including the microscopic-sized particles. Because gold is so malleable, as it is pounded, rubbed, and pushed along by the forces of nature, the gold will tend to hold together, while some impurities will be pounded out and washed free. So generally, pieces of gold become more pure as they are pounded and worked by the different forces of nature-especially in a streambed where it can be heavily pounded by rocks, boulders and such, along with the steady flow of water to help wash away the impurities. This pounding also has the effect of breaking the gold down into smaller pieces, from which more impurities can be washed free. And so it is generally found that smaller pieces of gold are of richer gold content than the larger pieces originating from the same source. For example, the fine and flour gold recovered out of many gold-bearing streams in the Western U.S. will be found to have a gold content greater than 90%. 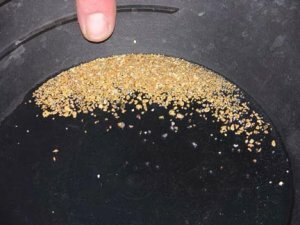 Nuggets recovered out of the very same deposits can be found to have a gold content of less than 80%. At first glance, this might seem to indicate that fine gold has a greater value than the coarse gold, and this is true as far as the actual gold value is concerned. However, larger pieces of gold have “jewelry specimen value,” due to their own unique and natural characteristics. So they can bring in a greater monetary return than their actual gold value. Fine gold is usually sold to a refiner, who then melts it down and refines it into pure bullion form, to eventually be sold on the world gold market. There are two ways of labeling the gold content of raw and unprocessed gold which are commonly being used in the field today. The “fineness” or “percentage system” is used most often among miners and refiners. This system breaks down the purity into thousandths in order to label the “fineness” (purity) of the gold sample. For example, a specimen that contains 90% gold and 10% impurities would be labeled .900 fine; 88% gold content would be labeled .880 fine; 75% gold content would be indicated as .750 fine, and so on. In this system, “.999 fine” is used to indicate pure gold. The fineness system is often used among assayers to indicate the gold content in the samples which they test. The other system sometimes used to indicate the gold content in your samples or specimens is the “carat system.” This method is most commonly used within the jewelry business, and is based upon a 24-point system with 100% gold content being 24 carats, 50% gold being 12 carats, 75% gold being 18 carats, and so on. Scales having these measuring increments are usually available wherever gold mining equipment is sold. This troy system is most-commonly used by miners in the field and when gold is sold on the open market. A troy pound is equal to .3732 kilograms, whereas a standard pound (avoirdupois) is equal to .4536 kilograms. So you see that they are not the same, a standard pound weighing considerably more than a troy pound. Also, please take note that there are only 12 troy ounces to a troy pound, as opposed to the 16 ounces it takes to make up an avoirdupois pound. The result is that a troy ounce weighs slightly more than a standard ounce. One of the best ways to get beyond your own uncertainty of what natural gold looks and feels like is to get your hands on some of the real thing. Once you have experienced real gold, you are much less likely to make mistakes. 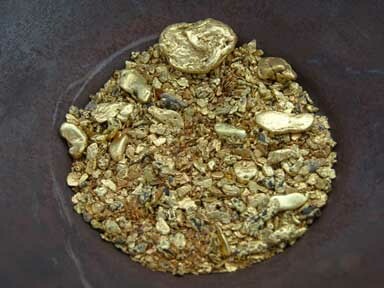 Here is a link where you can buy a sample of natural gold. Glitter Test: Gold does not glitter. It shines. Sometimes it is bright; sometimes it is dull; but very seldom does it glitter. The thing about fool’s gold (pyrites or mica), is that because of its crystalline structure, it tends to mostly be of glittery appearance. Take the sample and turn it in your hand in the sunlight. If it is gold, the metal will continue to shine regularly as the specimen is turned. A piece of fool’s gold will usually glitter as the different sides of its crystal-like structure reflect light differently. Old-timers used to put specimens in their mouths and bite down to test if they were gold. This is another way of testing the larger-sized specimens. However, keep in mind that a larger-sized piece of gold is worth a great deal and the resulting tooth marks could lessen its value. If you find a true piece of gold big enough for you to bite on, I can assure you that you will have very little doubt that it is the real thing, simply because of its rich nature and its weight. But if you are still uncertain of your find, you might try using the sharp edge if a knife and gently press in on the specimen in a place which is less visible. If it is gold, an indentation can easily be made into the metal with the blade of your knife. You will not dent its surface if it is a rock or iron pyrites. Acid Test: Nitric acid will not affect gold (other than to clean it); whereas, it will dissolve many of the other metals found within a streambed. Nitric acid can be purchased from some drug stores or prescription counters, and can sometimes be found where gold mining equipment is sold. If you question whether your specimen is some metal other than gold, you could try immersing it in a solution of nitric acid. If your specimen is gold, it will remain rather unaffected. If it is most any other kind of metal, it will dissolve in the acid. Nitric acid will not affect iron pyrites or mica (fool’s gold), but they are brittle and neither will pass the hardness test. CAUTION: Nitric acid can be dangerous to work with, and certain precautions must be taken to prevent harm to yourself and/or your equipment when working with it. These, and mixing instructions, are covered in Chapter 7 of Gold Mining in the 21st Century. Platinum is an industrial metal, one of a family of six separate metals: platinum, palladium, iridium, osmium, rhodium, and ruthenium. These metals are frequently naturally alloyed among each other so that they are seldom found separately. Platinum is a valuable metal, its value ranging in the same neighborhood (or higher) as that of gold. It also has a high specific gravity, sometimes even heavier than gold, depending upon how much iridium is present. Sometimes, platinum will be present in placer gold deposits, and so will become trapped in the same recovery systems which are used to recover gold. Sometimes platinum will be present in enough quantity that it can be worth a great deal of money for you to know what it looks like, so you do not discard it along with the waste materials. Platinum is usually a dull silvery-colored metal, much like steel-only different, in that it is non-magnetic and is not affected by nitric acid like steel is. Platinum does not rust. Platinum usually comes in the form of large and small flakes, just like gold, and sometimes in the form of nuggets. Platinum does not have as great an affinity for mercury (quick-silver) as do some other shiny metals. However, it can be made to have affinity for mercury by the use of certain involved chemical processes, or by putting a negative electrical charge into the mercury. Russia has been the world’s number one producer of the platinum metals for the last hundred years or so. If at first you have difficulty in telling the difference between platinum and lead, remember that platinum usually takes on a dull shiny color, whereas lead does not shine at all-unless it is polished or covered with a coat of mercury. Lead (and mercury) are also easily dissolved by nitric acid, whereas platinum remains unaffected. Most other shiny, silvery-colored metals which will be found in the recovery system will be magnetic. Platinum is not. Native silver has a specific gravity of about 10 or 11, so it is heavy. It will be trapped in most gold recovery systems if present as itself in a placer deposit-which is uncommon. Generally, silver in its native form does not look like shiny silver-like in silverware. It looks more like a silver-colored rock which is uncommonly heavy. Sometimes, native silver is so tarnished that it cannot be distinguished by color at all.